Women felt hats are hat made from felt and wool blend material. Some felt hats are made from high quality felt while some are not. They can differ in styles- fedora hats, pork pie hats, cloche hats, and cowgirl hats. There are also different colors and styles for your consideration as well. Best women’s felt hats are one of the ideal options for colder days of the autumn and winter. 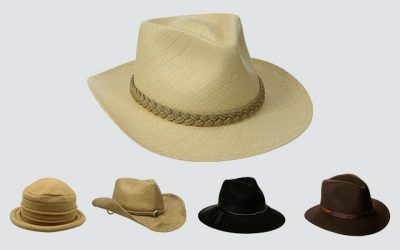 If you are looking for types of hats to wear in the summer, you should take a look at some other hats here. Back to our topic, don’t waste your time shopping around. There are thousands of choices that you can find on the market and it would be challenging for you to find the one that is your style as well as the the one with premium quality and craftsmanship. 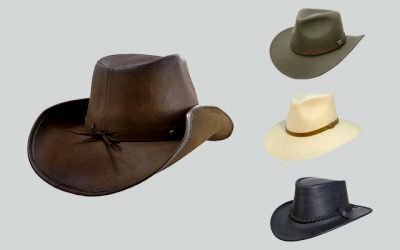 So save yourself sometimes and scroll down for the best felt hats of high quality and construction as well as the stylish look that you want. 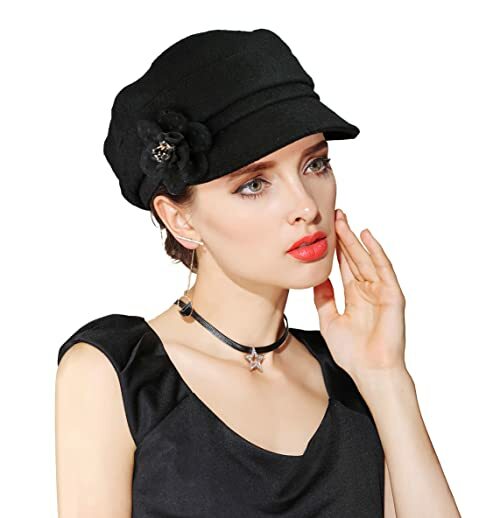 If you are looking for a black felt hat that is stylish and elegant, with no extra details? Check out this beautiful hat from Urban Coco. Besides black, there are other solid colors for you to choose from such as camel, royal blue, and coffee. The style of this hat features a domed crown and a large wide brim. You can choose to wear this hat with both casual and formal attire. 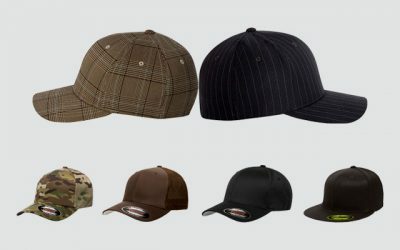 The material of this hat is soft and smooth which is also very lightweight and well-ventilated. It is also foldable so that you can carry this hat with you when you go travelling. Also, when you take this hat out, it will spring back to its original form easily. If you see wrinkles or ceases appear on the hat, you can quickly flatten the hat by steaming or ironing it. You can look here for other tips on taking care of a felt hat. While there are 2 options of colors for you to choose from including red and black, however, these colors are the most classic choices of colors that will go nice with every dress you have. If you are looking for a red felt hat for a strong fashion statement, this is the hat you should root for. The colors on the hat are very vibrant and solid, which will remain the same shade after a long time and even after a few washes. In addition, the material of this hat is 100 % of wool. The material is soft and comfortable to touch. It also has a decent thickness without being too heavy. The brim of the hat is also as soft as the look of this hat. You can crush the hat and pack it into your bag. The width of the brim is 4.7 inches, which is wide enough to cover most of your face as well as your neck and your ears. 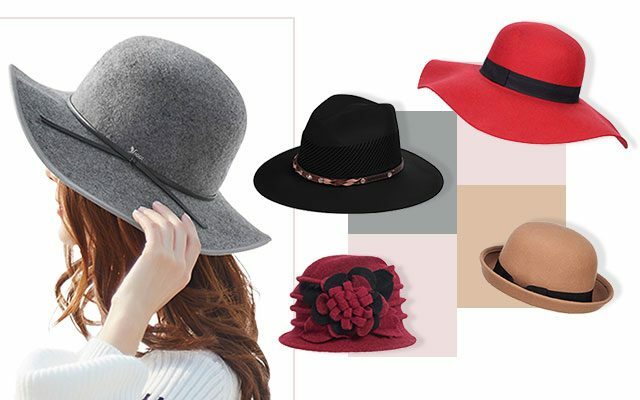 In addition, with the thick fabric, the hat is capable of blocking most of the harmful sun rays away from your face, protecting your sensitive skin. The construction of this hat is tough and durable. The stitched lines on the hat are nicely one so that all of the parts of the hat are stitched nicely for extra durability. Thanks to its solid and bold design, you can wear this hat for a casual or formal feminine look. Felt hats are known for giving you a traditional and classic look. Still, there is no other vintage felt hat for women that is as vintage as this hat. And if it is what you look for, check out this hat from a reputational hat company- SIGGI. This hat is made of 100 % of wool featuring the fedora style, including a classic round brim with the width of 3.1 inches. 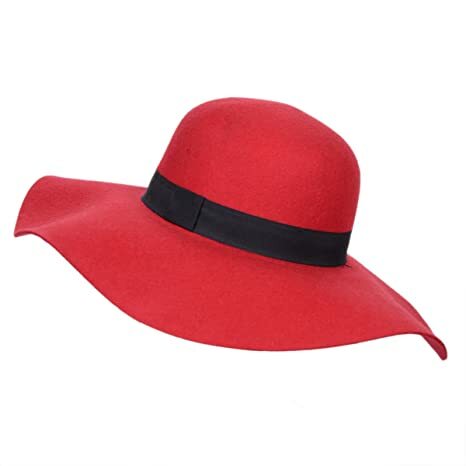 This vintage hat is available in 3 colors, which are red, black, and grey. The material is of top notch quality to be very smooth and silky on the touch. In addition, it is very lightweight and comfortable to wear on your head for a long time. Although it is made from wool, it would not cause irritation or itchiness when you have to wear it for a long time. The brim of this hat is about 3.1 inches. While it might not be wide enough to cover your face under the harsh sun rays, it will not block your view. It is floppy and elegant. Thanks to the inner wire which is built around the brim, you can easily shape the brim to whatever style that you like. You can wear this fedora hat to a wide range of occasions- from weddings, tea parties, and night outs. This hat is also casual enough to you to wear every day, when you go out running errands. 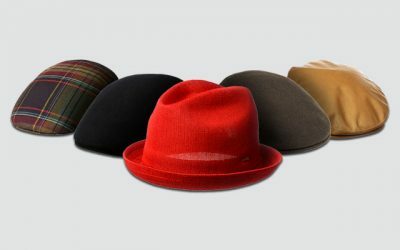 This felt fedora hat is made of 35 % of wool and 65 % of polyester. On the other hand, the lining of this hat is made of 18 % of cotton and 82 % of polyester. There are 10 options of colors for you to choose from – including beige, black, white, red, and pink. The blended material makes the hat soft and breathable. In addition, you can crush and pack the hat into a small bag for convenient carrying and storage. While this women’s felt hat is available in 1 size, it come in a Velcro tap which is adjustable so that you can have a comfort fit. In fact, it fits most perfectly for the head’s circumference from 22 to 23 inches. 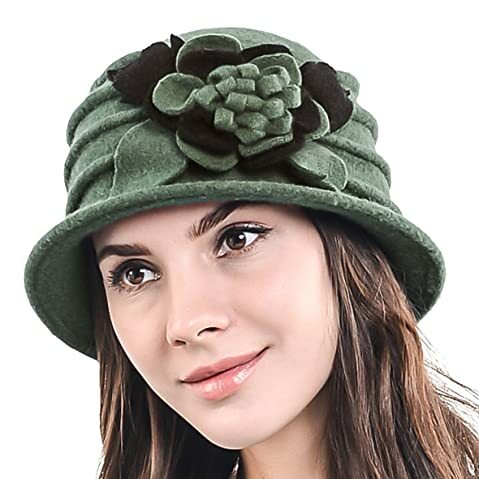 Another thing that you would love about this felt hat is the floral detail on the hat which brings a classy and elegant look to the hat. Not to mention that this detail is well made with a high level of craftsmanship with very solid stitching line. The floral detail would stay secured the hat. You can wear this hat to various formal events such as weddings or churches. This beautiful hat has a minor problem though. The brim of this hat is quite soft. And as a result, it can lose its sheaf quite easily, especially when you don’t handle this felt hat with care. Here comes another high quality felt hat with a unique and trendy look. This felt hat features the newsboy hat design with a floral design accent on the side of the hat. This hat is made of 40 % of wool and 60 % of polyester. The material is thick enough to retain heat and keep your head cool in the winter. In addition, thanks to the inner sweatband, it is convenient for your forehead when you wear this hat for a long time. 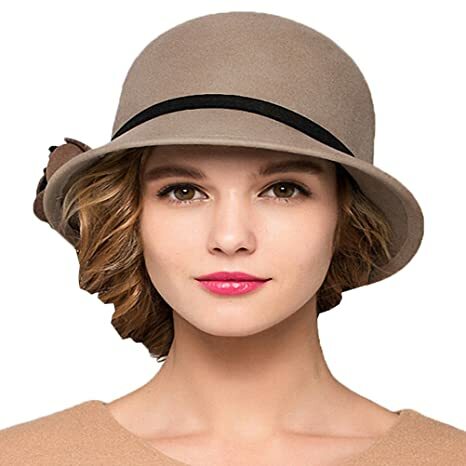 Undoubtedly, this newsboy cap is one of the most versatile and stylish winter hats for ladies. It has a subtle detail that makes the hat look classy and dressy without making it too outstanding. You can wear it with your casual clothes such as your dress for an elegant and feminine look. 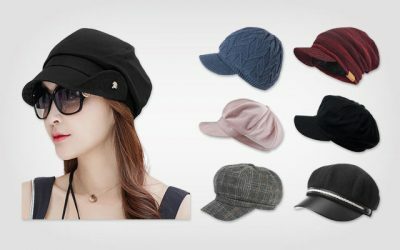 Last but not least, this newsboy cap is crushable and foldable to stuff into a small bag or pocket without leaving any crease; making it easier for you to bring it along with you when you travelling. The choices of colors that you have with this hat are not so many. They are available in black or grey only. Still, these colors are the basic neutral colors that you can easily pair with other pieces of clothes in your wardrobe- whether that you have dark colored clothes or brighter options. This hat is made of 100 % of wool featuring the style of a bucket hat. Moreover, there is a bow attached to the headband on the side of the hat. You have 6 options of colors for you to choose from, including black, blue, camel, orange, red, and wine red. You also have the bow detail in the same color while the head band is black. The wool material is of premium quality which is silky and smooth on the touch. And while the fabric of this felt hat is thick enough to keep your head warm in the cool days, it is also lightweight and comfortable to wear all day long. Besides, there is an internal sweatband to help wick moisture away and keep your head cool. Also, it can prevent the wool material from rubbing your forehead as well as preventing irritations. The construction is firm and quite solid which help the hat to remain its shape for a long time and would not deform easily. Remember to wash this hat with hand and in cold water only to prevent the hat from shrinking. This hat can be your ideal choice in the cool spring and fall days. You can wear it with your daily outfit or when you go out to a party or a date for an elegant and charming look. If you are looking for a classic bowler style, check out this hat. It has a round crown and a slightly upward curved brim. It has a black grosgrain ribbon attached to the crown of the hat. With solid colors and no added décor, you can pair this hat with most of the clothes in your wardrobes. It would go well with nice dresses you have for a night out. You can choose between two options of colors including tan and black. This hat can fit you if your head’s circumference is less than 24 inches. And with the inner hatband, you can easily adjust the hat to ensure you have the best and most comfortable fit. The material is extremely soft and warm. It also has a certain level of thickness to keep your head cool and warm at the same time. Another thing that I like about this hat is that it has a very solid construction. Therefore, you don’t have to worry about the hat deforming over time. In addition, the brim of this hat comes with an inner wire so that you can easily shape it up and down. Also, the wire keeps the hat from becoming flimsy in case of a high wind. However, the hat is not foldable or crushable. Therefore, you might find it challenging to bring this hat along with you when you go traveling. For anyone who like the elegancy of the French style, check out this French wool beret. It is made of 100 % of wool with soft lining. 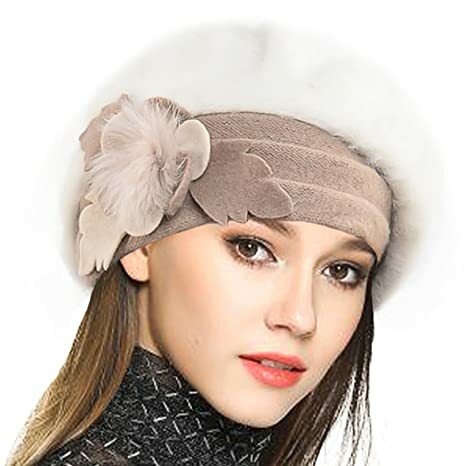 It features the elegant style of the wool and angora surface knitting brim cuffed, soft fur line, as well as the decorated flower as well as hairball and leaf detail, a bow, and a Liffle fur. You can choose among 14 options of colors- from red, navy, to beige and camel. This beret can guarantee you the warmth and coziness that you would need in the cold winter days. 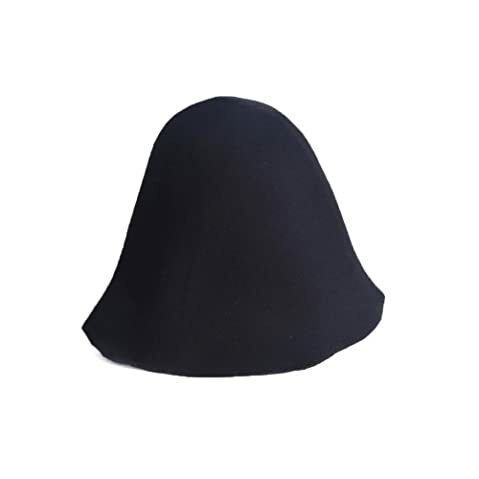 Thanks to the high quality material, this beret is comfortable and breathable, even for the most sensitive skin. In addition, this felt beret can stretch nicely for a snug and comfortable fit. In addition, this beret hat is well made. All of the details on the hat are nicely stitched together with no sign of loose threads. These details are also very secured and will not be likely to fall off. This hat is the most suitable to wear in the winter. Pair it with long sweater, scarf, leggings, and boots and you are good to go. 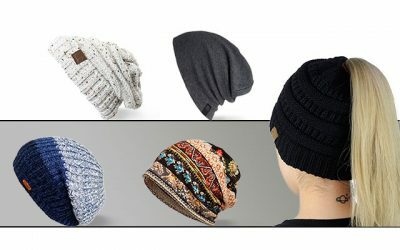 Are you looking for a semi product (like a felt body, a cone, or wool hood) so that you can easily design your own hat for the look that you like? If your answer is yes, this one is for you. This cone cloche is made of 100 % of natural wool. 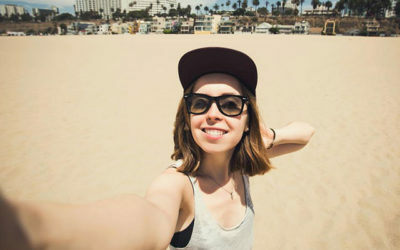 It has no chemicals used to process the hat so that it is suitable for you if you have sensitive skin or don’t want to use any product with chemical. There are 15 choices of colors for you to choose from. These colors are nicely dyed so that they all look bright and vivid. In addition, they will not be easily faded away over time. This cone cloche is of premium quality, especially when you look at the price. However, you should keep in mind that it is not actually a finished hat. Therefore, the edges of the hat are a little bit uneven. 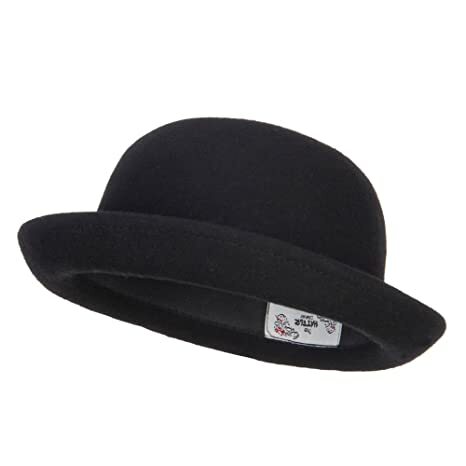 This bowler hat is made of 70 % of wool and 30 % of polyester. The blended material makes the hat not only soft and warm but it also allows the hat to be very elastic. You can easily adjust the hat for your most comfort fit. The construction of this hat is well made with an excellent craftsmanship. The brim of this hat is nicely wired that surely will not deform easily. Also the floral detail of the hat is firmly stitched that it will not easily fall out of the hat. There are 10 options of colors for your consideration. You can opt for a cold shade such as green or dark gray. Alternatively, you can choose a much brighter option like red and pink to brighten up your cold days. This hat with the ladylike style is suitable for the cold weather. It goes well with both of your formal and casual clothes. The floral detail on the hat will surely bring an elegant and feminine look that you desire for you. This hat can be spot clean and you should not wash the hat with water too often to prevent the sensitive wool material from deteriorate. 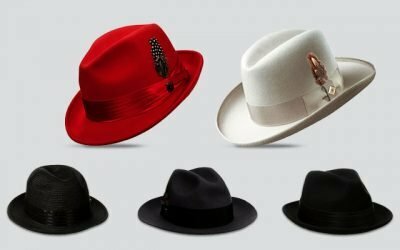 Do you like the traditional and classy look of felt hat, but you think that the felt hats are quite hard to take care of? Washing by hand only? No hot water? No ironing? Then you will like this felt hat made from canvas. 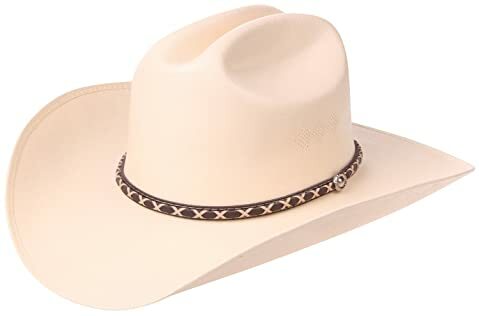 The design of this hat is a classic and traditional cattleman style. You can choose various colors such as classic sand, beige, and khaki. As I mention above, canvas felt hats are easier to care for. The material itself is tough and durable. You can wash the hat both by hand and with the washing machine. In addition, it is weather resistant so that it would look nice and age nicely over time. While the material of this hat can be tough, it is still comfortable for your head to wear this hat for a long time. Thanks to the sweat band which is made of premium cotton, your forehead will not feel irritated at all. Last but not least, the hat is built nicely with an excellent craftsmanship. Therefore, it is capable of staying in its form regardless of how frequent you wear the hat. Also, you can easily reshape the brim of the hat to whatever style that you like. The brim is also so firm and sturdy that it will not become flimsy at all. This cowgirl hat is suitable for theme parties including birthday parties and Halloween parities, as well as festivals and night outs. You can choose this stylish and trendy cowgirl hat for your Western inspired attire as well. 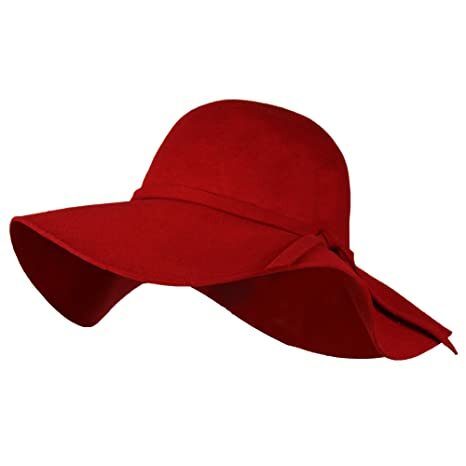 This hat is made of 100 % of wool featuring the style of a felt floppy hat in solid red color. The brim of this hat is 4 inches in width. It means that this hat is capable of offering a large area of your face, protecting your face, ears, and neck from the harmful sun rays. 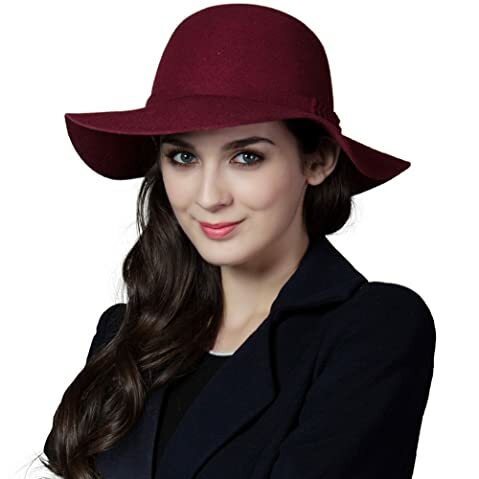 The material of this hat, like other high quality wool hat, is of premium quality. You can feel the warm and soft texture of this hat. It is also very lightweight with a decent weight to ensure your best comfort. Moreover, this felt hat has an inner sweatband for a comfortable fit. The sweatband also helps to regulate the air and keep your head cool all of the time. Furthermore, this floppy hat is well made with a firm and solid construction. As a result, this hat will not deform easily. Though, you can easily fold the hat and pack it into your bag for convenient carrying and storage. Keep in mind that this is a floppy hat. Hence, the brim of this hat can become flimsy in case of a high wind and block your view. This hat has a vintage look as well as color. 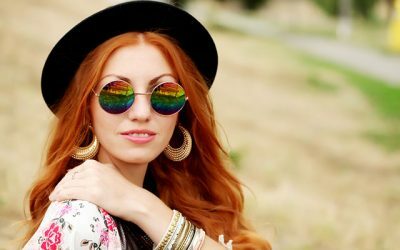 You would be able to create a strong fashion statement if you pair it with your classic, hipster or Bohemian clothes. 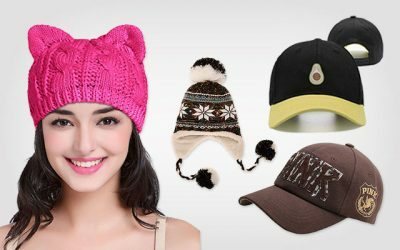 That are just a few options of felt hats for women that you can find in the market. However, they are undoubtedly the best ones you can purchase. They are made of premium quality – regardless of wool or felt blend. They are built in a solid construction that will last for a very long time. And they do look fashionable and trendy as well. If you want to buy a felt hat for the upcoming colder days, check out our review. I hope that with the list above, you can quickly find the most suitable one to add to your hat collection. 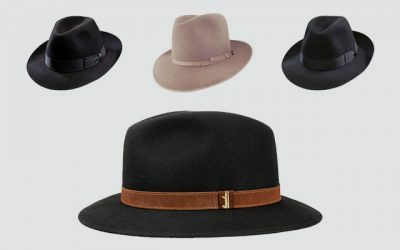 I’m all about the traditional fedora or the pork pie. Wonder why it’s called the pork pie.